Summary: Lauren’s left Beverly Hills, and Matt has stayed behind, as she wanted. He thanks Kelly for being so great to his wife, and for, you know, going to Mexico and smuggling drugs to try to help her. They haven’t yet discussed where their relationship stands, and though it sounds like they want to get back together, they want to give each other time. Gina and Donna continue confronting Felice and Bobbi about how Felice didn’t stop Bobbi from taking money from Gina’s trust fund. 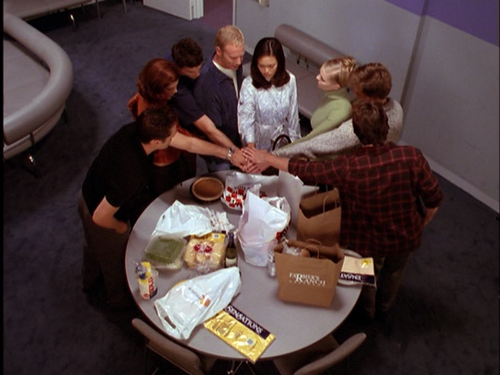 Gina storms out of their lunch, intent on suing for the money. Donna confides in Noah that she feels stuck in the middle of the family feud. Noah offers comfort by kissing her, but things get awkward when David arrives. Donna tries to talk to David, who tells her she made her choice, so she has to live with it. Dylan’s out jet-skiing and starts racing a guy who’s been drinking. The guy cuts him off and Dylan falls off, getting knocked out. Someone pulls him out of the water and revives him on the beach, then runs off. As he does, Dylan pulls a hospital bracelet off of his wrist. At the boutique, Donna tells Kelly that she and Noah are still together, rather than back together; they never officially broke up. She laments that David doesn’t understand that. Kelly reveals that something happened with her and Dylan in Mexico, but she doesn’t give any details. Gina arrives and announces that she’s suing Felice for more than a million dollars – the money she lost plus a bunch for pain and suffering. Kelly criticizes her, but Gina doesn’t care what she thinks since she’s back with Matt two days after Lauren left. Matt works on a plea deal with a deputy DA named Jay, arguing that his client is being railroaded for a drug charge because she’s African-American. The client, a teenager named Linda, refuses to plead guilty to a crime she didn’t commit. Dylan tells Gina about his jet-ski accident and how he’s going to search for the guy who saved his life. He asks about her lawsuit, but Gina doesn’t want him to get involved. They agree to keep their current activities separate from each other. 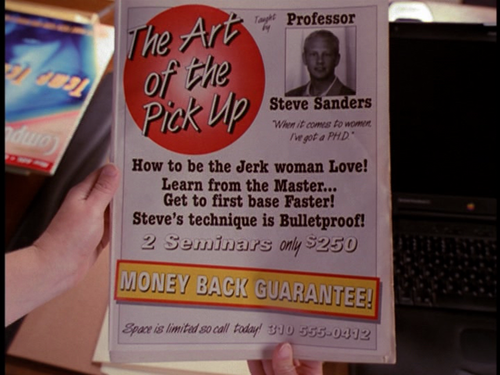 Steve acquires a black book from a “madam to the stars” who wants to expose her clients. Steve is eager to increase circulation, but Janet knows they’d be hit with a ton of lawsuits. Dylan looks for his savior, Patrick, but is told that he died in December. Ooh, Dylan was saved by a ghost! This is a twist! Kelly comes over, worried that she cheated on Matt by sleeping with Dylan. Dylan is zero percent worried that he cheated on Valerie. He notes that this isn’t the first time he and Kelly have hooked up while he was dating someone else. Dylan also thinks that he and Kelly will wind up together someday. Donna approaches David at the After Dark, wanting to make sure she hasn’t ruined their friendship. She’s sure he’ll find someone else to be with. She encourages him to try new things so he can meet someone different. David balks, so Donna comes up with a new idea: He can pimp himself out over the radio. (Okay, maybe that’s not what she says, but it’s what she means.) David challenges his single female listeners to convince him that there’s someone out there for him. Dylan goes to the hospital and confirms that Patrick is dead. Also, there’s a rundown playground for young patients next to the hospital. Think that’ll be important later? Dylan learns that Patrick was only seven, so the guy who saved him definitely isn’t Patrick. The doctor he talks to wonders if the guy is Patrick’s older brother, Tim. Matt invites Kelly and Dylan to dinner to thank them for what they did for Lauren. I’m sure that won’t be awkward at all! Steve consults with Matt, who tells him he can’t be sued for libel if the information in the black book is true. Steve wants to prove that a talk-show host named Mark Chapel is sleeping with prostitutes; he’s going to tail Mark to confirm it. Donna’s now against Gina’s lawsuit, since she’s going after Felice instead of a bank. She thinks Felice just made a mistake. Gina wants to ensure that she has money in the future, and this is the way to do it. She wishes Donna would stand up for her like she did when they were kids. Matt approaches Jay again, having spotted his name in the black book. Jay wants to be DA someday, so that information coming out could be devastating to his career. Matt tries to use it to get the charges against his client dropped, but the attempt backfires. Now he’s tried to blackmail a deputy DA. A bunch of women send David letters, but there’s at least one who’s not interested in him – a Venezuelan woman calls in to mock him. David puts her on hold to talk to her off the air, but he accidentally hangs up on her. Donna, Gina, Felice, and Bobbi go to dinner so Felice and Gina can fight in a different location than usual. When Bobbi goes outside to smoke, Felice complains about her sister’s lack of self-control. Dylan finally tracks down Tim, who doesn’t care that he saved a life. He was responsible for his brother’s death in a car accident, and he hates himself for it. He mocks that Dylan must think fate put them on the beach at the same time. Dylan does. Tim admits that he was trying to kill himself when he came across Dylan. Steve and Janet go on a stakeout to bust Mark for sleeping with a prostitute. Janet notes that they don’t know anything about Mark. Steve thinks the fact that he keeps a hotel suite full-time is enough to prove there’s something going on. But when Mark comes out of his house, Steve figures out what’s probably really going on: Mark and his wife are separated, and he sleeps at the hotel instead of their home, then comes home early in the morning so his kids don’t find out. David tells Noah that the Venezuelan caller is coming to the station to meet him. Meanwhile, Claudia, a Latina woman on the After Dark’s cleaning crew, mops around them. Are you putting the pieces together? Because David isn’t. His admirer shows up, but she’s not the caller, so David isn’t interested. Dylan, Kelly, and Matt have their dinner together, because this episode is all about awkward meals. Dylan doesn’t think they should be thanked because Lauren didn’t actually let them help. He’s become existential because of Tim. Kelly and Dylan think it’s a bad way to think. 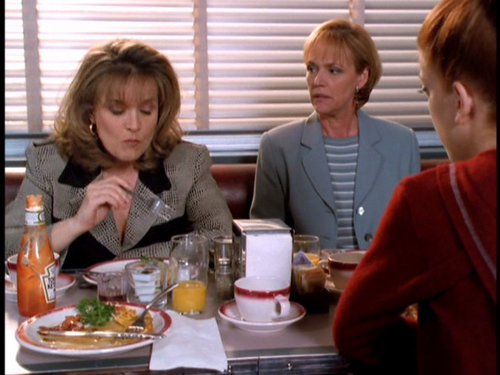 Donna and Felice eat at the Peach Pit, which is really weird. I’m surprised Felice even sets foot in there. Donna wonders why they’re not close to Felice’s family, but Felice thinks it’s obvious – Bobbi and Gina are trainwrecks. Donna says that Felice would rather turn her back on her own sister than admit that she made a mistake. She needs to pay Gina what she’s lost. Dylan tells Gina that he’s been going through the motions for months, and the jet-ski accident shook him up. He still doesn’t care about anything, though, and pretty much tells Gina she doesn’t mean anything to him. Matt’s blackmail paid off after all, and Jay agrees to drop the charges against Linda. He blasts Matt for being unethical, but Matt doesn’t care. He tells Kelly that he wanted to save Linda since he couldn’t save Lauren. Lauren’s friend Anna comes by with divorce papers – Lauren wants Matt to be free to date other people. Steve destroys the black book, telling Janet he feels sympathy for Mark since he went through his own parents’ divorce. Learning about Mark’s life has opened up old wounds. Felice tells Gina that she’ll pay back the money if Gina drops the lawsuit. Gina hesitates, so Donna tells her how she stuck up for her. Bobbi and Gina get the last laugh when they tell Felice how much Bobbi used to trash-talk her. Dylan returns to the hospital, having financed the overhaul of the playground. What a surprise! He’s invited Tim there to help rebuild it. Their existentialism is immediately cured! Kelly and Linda both think Matt deserves good things, even though he may have done bad things to get there. Kelly has decided that she’s ready to get back together with him. Gina and Bobbi go out to celebrate the fact that Gina’s getting her money. The whole deal with the trust was a scam to get money out of Felice. Sneaky! David calls off his pursuit of a new love, deciding to leave it up to fate. He sees Claudia watching him and goes out to talk to her. The second she talks to him, he realizes she was the caller. She tells him she was leaving things up to fate, too. Outside, Matt and Kelly officially get back together. So that’s a happy ending for everyone, I guess. Thoughts: Jay is played by Kevin Rahm (Ted on Mad Men, Lee on Desperate Housewives). Anna is played by Real Housewife Kyle Richards. I like the twist with Gina and Bobbi. It was very Valerie/Ginger. Noah has no purpose on this show anymore. Not that he ever really did, but now it’s even more obvious. Summary: Kelly reads a magazine article by a woman named Emma Bennett and suggests that Brandon have her write something for the Beverly Beat. She will regret this later. Donna cooks Noah breakfast, but their alone time is interrupted by Felice. Donna confronts her mother for not mentioning that they’re auctioning off the family’s boat. This will leave Noah homeless. Felice is stunned to hear that Donna and David have broken up and that Donna’s spending time with Noah the “wharf rat.” Donna’s shocked that Felice is being superficial, because Donna’s never met her mother. Kelly’s working at the Wyatt Clinic now with Dr. Monahan, hero to the downtrodden. Valerie visits Noah on the boat to ask him what he plans to do with the After Dark. She’d like to run it again. Noah taunts that he might take that job, but Val doesn’t think he’d like working inside. He won’t budge. David goes to the Beverly Beat to look at the classifieds, and Steve advises him to make nice with Noah so he can get his job back. David would rather never think about Noah again. Brandon doesn’t know that Noah’s dating Donna, and David’s mad that Brandon wants to take Noah’s side. Carly and Steve are supposed to go on a date, but Zach’s sick. Noah finds David moping at the Peach Pit and asks him to run the After Dark. David thinks Donna’s behind the offer and turns it down. Kelly’s been talking up Monahan, which makes Brandon a little jealous, but she tells him Monahan is married. Brandon has taken her suggestion to meet with Emma about writing for the Beverly Beat. David starts a job at a store called Khaki Nation, and why would anyone shop in a place with that name? Steve takes Carly to the Walshes’ house for a little alone time. Valerie and an exterminator interrupt. Steve’s having a bad week. Brandon offers Emma a job, but she’d rather stick to freelancing. She agrees to write an article to see how things go. Also, she couldn’t be coming on to Brandon more if she actually said, “I want to make out with you right now.” The After Dark is doing well under new management, so Val can’t bug him about that. Instead, she warns him that karma will get him for what he’s done to David. Kelly has a stiff shoulder, so Monahan offers to examine it. And by “examine it,” he means massage it while sliding off her sweater and camisole strap. Kelly’s creeped out, as she should be. At the beach apartment, Donna crabs at David, telling him he’s the one responsible for losing the club and not letting Noah make things up to him. Noah tells Valerie that she was right about him not being able to run the club, and he’d like her to come back to work. She negotiates a deal and accepts. Kelly tells Brandon about Monahan’s unprofessional behavior, though Brandon doesn’t see it that way. He thinks she’d be more sure if Monahan really crossed a line. She was probably just uncomfortable because she was being examined by someone she knows. After all, she’s talked him up so much that there’s no way he can be a bad guy. Kelly accuses Brandon of accusing her of making things up. Brandon says that if she were really uncomfortable, she would have said something. David’s horrible at his job and gets blasted for being unprofessional. He’s already past his limit and quits. Monahan asks Kelly to sit in on an exam so he can’t be accused of sexual harassment or impropriety. Hi, irony! How are you? Speaking of unprofessional behavior, here’s Emma. Brandon’s clearer on her behavior being inappropriate than he was about Monahan’s. Steve and Carly try again for an afternoon delight, but her mom has already beaten them to it with a date of her own. Also, she’ll be going to Arizona for a few months, so there goes Carly’s babysitter. Noah’s interested in the Valerie who puts a lot into her work, since so far he’s only seen the shrew version of Val. Later, Val runs into Donna at the Peach Pit and reveals that she’s working with Noah. Donna goes straight next door to yell at her boyfriend for his bad decisions. He promises that there’s nothing personal going on, and besides, Donna has no right to say anything since she still lives with her ex-boyfriend. Donna doesn’t want to have to deal with Val hovering around her and Noah, though Noah thinks she’s backing away because Felice disapproves of him. Brandon declines to tell Kelly that Emma hit on him. Kelly says she thinks she overreacted to Monahan, who’s always so careful with his female patients. Steve assures Carly that he’ll help her find another babysitter for Zach, and possibly not just because if they don’t find one, that’s it for Steve’s love life. Carly realizes that they’re finally alone in the house without even trying. Emma gives Brandon her article and hits on him some more. David and Valerie hang out, talking about his new job at a carwash, and run into Donna. Her anger at seeing them together makes Valerie want to spend more time with David to make Donna and Noah jealous. David isn’t sure the plan will work, but he’s willing to go along with it. At the clinic, Monahan tells Kelly that she looks beautiful today, which doesn’t fill her with joy the way he probably hoped it would. Donna meets Felice for the boat auction, and Felice apologizes for butting into Donna’s life. She should really apologize for the horrible things she said about Noah, but this is probably the best we can hope for. Just before the bidding ends, Noah arrives and offers $325,000 for the boat. Felice thinks he’s goofing off, since he’s a pathetic little street urchin. He gets the boat, and when Felice sees his check, she realizes who his family is. Donna’s proud of herself for keeping quiet, knowing Felice would treat Noah differently if she knew he had money. Noah and Donna make up, and now they have their own boat to make out on whenever they want. Brandon notices that Kelly’s a little down, but she insists that everything’s fine. Emma calls, because it’s been five minutes since she flirted with Brandon, and she’s about to stop breathing. He turns down her offer to come over and check out her lingerie, but she’s sure he’ll eventually change his mind. When Kelly asks who called, Brandon tells her it was a wrong number. Thoughts: “Wharf rat”? Go away, Felice. Ugh, Brandon. Way to listen to your girlfriend, you jerk. Your attitude is one of the reasons women don’t report harassment or assaults. I don’t think I could hate Emma more if I tried. Part of me does want to try, though. Donna should be happy that Valerie’s spending time with David. It means she’s not spending time with Noah.